Hello. Meet Bobbi, brand new over in the DigiStamp Boutique. There are four Bobbi images - bathtime, balloons, little ted and flowers. And all on special offer for June. I coloured with Prismacolour pencils and blending solution. The papers are 'sweet day' by Echo Park. It's a pretty nice day here today so we are off out now. Taking the dog to the beach, and maybe a wee fish supper! very nice job your colouring is great!! This is gorgeous - another stunning card! What a stunner Liz! Fabulous colours. 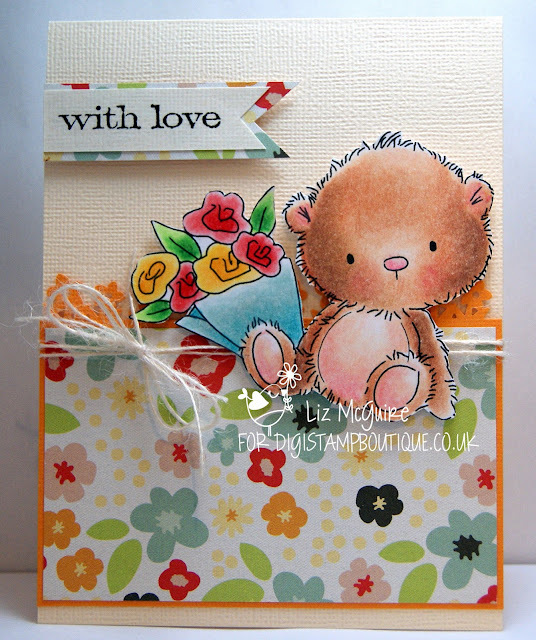 Gorgeous card Liz, I love the cute image and beautiful colouring. Gorgeous card Liz - WOW! Beautifully done and so very cute. Oh, this is totally adorable Liz, love, love, love it! This is absolutely adorable Liz, love it.